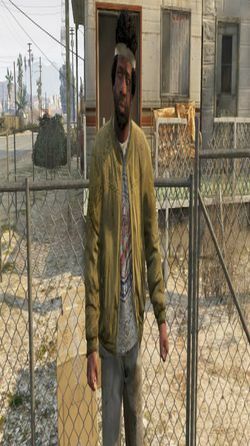 You may be looking for Denise Clinton, Franklin Clinton, Tavell Clinton or Clinton Aumick from Grand Theft Auto V.
Clinton is a character in the HD Universe who appears as a minor character in Grand Theft Auto V. He is voiced by Craig Anthony Grant. Clinton is a war veteran living in Sandy Shores, Blaine County. He can be met by Franklin Clinton, Michael De Santa and Trevor Philips on Armadillo Ave. He talks about his experiences in the armed forces.